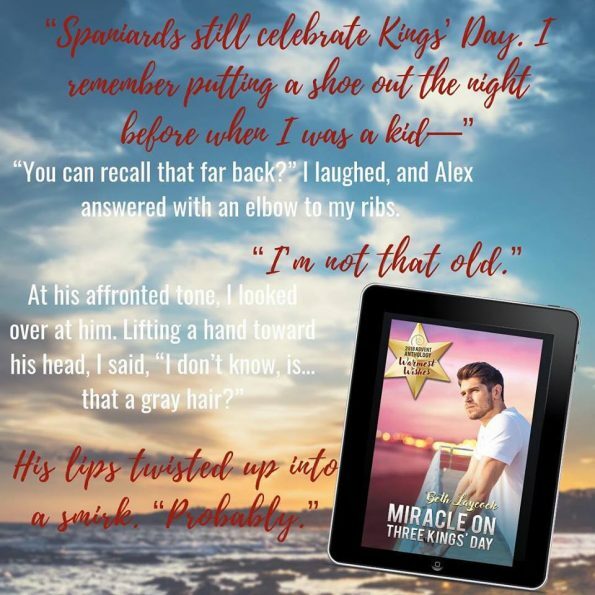 Review – Miracle on Three Kings’ Day by Beth Laycock – 4 Sweet, Perfect Stars!!! When Levi decides to spend a little time with his brother Jesse in Spain, to clear his mind, the last thing he expected was to find something more, something he’d been longing for. Can Levi and Alex work through their pasts and embrace the possibility of a new future, together? Beth Laycock has written a wonderful M/M Romance, from start to finish she held me captive in Levi’s story. I loved the added extra’s about the New Year traditions that are held in Spain, that Beth Laycock added to Levi’s story. I found it intriguing, and it fed my passion for knowledge and it gave this romance, its own uniqueness. It was clear Levi was a troubled man, and I wanted to just sit and talk with him, to help him talk through the things going through his mind. It was clear he had a lot of love to give the world and the one thing he had a passion for had taken a back seat whilst he battled with the demons in his mind. Alex was an intriguing character, and I couldn’t fully decide, along with Levi, what his intentions towards Levi were. However, I could tell the man was also genuine, he cared, and he was the type of person happy to help anyone, he just liked to keep his private life, private. This is a wonderful short contemporary romance, and although I enjoyed this story, I wanted more from the story too. I felt it needed a little more character and story development. This, however, is purely because I wanted more from Levi and Alex, I wanted to see their love blossom and I wanted to delve a little more into their pasts. This said, this story still holds the right amount of story, is a perfect short romance read. If you’re looking for a short M/M Romance, with a uniqueness, Miracle on Three Kings’ Day is for you.